Green beans, or string beans, are ubiquitous in Middle Eastern cuisine. They're commonly cooked along with beef in stews and are a frequently served side vegetable. Growing up, string beans were served more often than all other side vegetables combined. But at least hers were tasty, which is more than can be said for the gray, overcooked offering in the school cafeteria. The key to good tasting beans is in getting them to just the right amount of doneness. Not too crunchy (unless you like them that way) but definitely not mushy. If you do want them crisp and retaining their bright green color, the secret is to cook them for only a couple of minutes and then shock them in ice water to stop the cooking and set the color. But we like our beans more done than that so some of the bright color is lost. Still, we want green, not gray! As for the flavoring, we have a handful of bean recipe options but the one we make most often is this version with sauteed onions. Seriously, everything tastes better with sauteed onions. And the beans would be fine just like this if I'm serving them alongside some bold flavors. Try adding toasted breadcrumbs as topping. Since the beans aren't being baked in a sauce, like a mac and cheese, brown the breadcrumbs in the same pan used to saute the onion. Adding the za'atar to the mixture adds a wonderful flavor and aroma and really elevates this dish. Trim the ends of the green beans and add to a pot of boiling water. Cook on high heat for approximately 10 minutes or until the beans are fork tender. Drain. While the beans are cooking, Add 2 tablespoons of the olive oil to a skillet or cast iron pan along with the peeled and sliced onions. Saute for about 10 minutes until the onions are lightly caramelized. When the onions are done, remove from the pan and add to the cooked and drained green beans. Add the remaining 2 tablespoons of olive oil to the pan along with the breadcrumbs and za'atar. Saute for about 2 minutes, stirring often, until lightly browned. 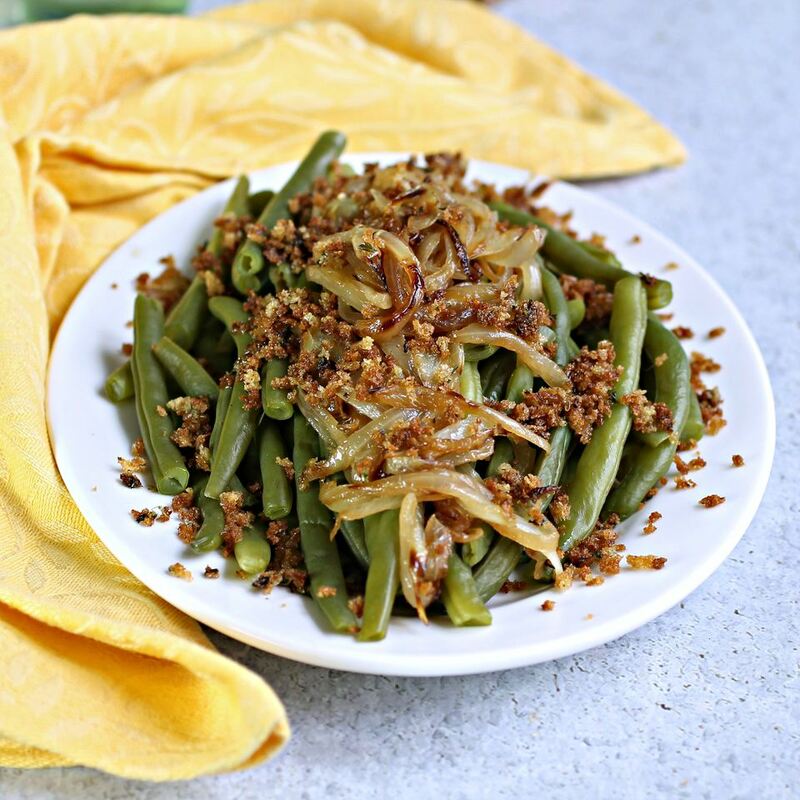 Toss the green beans and onions with the breadcrumbs and season with salt and pepper to taste.